Whats in a year? Johnny Fall Down 2016 – The New Batch! We loved our first commercial batch, released earlier this year to appreciation and common comments of ‘I dont like cider but I like this!’, and we hope to get that reaction from different people with every bottling. But one thing we won’t be doing is making sure every bottling tastest the same. It won’t. We will always strive to the highest standards, but the apples give what the apples give and our goal is to try to create what we think is the best way to express that flavour as we can. For a crash course in cider geekology, read on. If you’re not that interested just check out our ‘Want Some‘ link to taste this batch and see what you think! Our goal in the first year was to create as much complexity as possible but keeping to within a reasonably narrow bandwidth of balance between tannins, acidity and sweetness. This is in order to try to introduce some of the subleties of cider made from apples to people who were willing to take a chance on our bottle. We didnt have too much pressure so kinda let it do its thing, (within reason! ), and were able to leave it sit in the cellar for some months to settle the tannins down a little. The results were better than we had hoped. Simply put it was a good drop, with its main characteristic really being attributable ta very strong natural malolactic fermentation which gave us some crazy flavours we loved. It also reduced the acid significantly, which is a good way to allow us to balance it with less back sweetening, but left it a little lacking when it came to pairing with foods. That said, we get what the apples give, and this year we had more varietals with stronger, more astringent, (drying), tannins, so we kinda knew it would be going in a slightly different direction with this bottling. And to the 2016 Batch! In this batch, grown in 2016 and just released this week in (July 2017), we thought we’d aim to bring out the strengths of a cider that could be better paired with food. Hence we selected varietals that had some higher acidity to go with the tannins, (acidity pairs great with lighter acidity, also in cutting through heavier or fattier flavours, tannins pair well with fattier meats and also sweeter flavours). We tried to keep the same balance between sweetness and acidity, and of course waited for the natural malolactic fementation to take place. We also didnt let it go as far so as to keep the flavours a little crisper and cleaner so as not to interfere too much with the flavours of food. 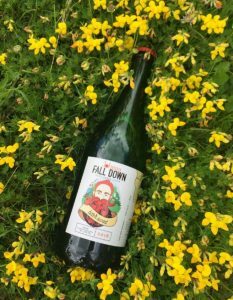 We do find the tannins a little perky at the moment, and ideally they would have got a few months of aging before release, but we have some people pining for JohnnyFallDown in bards and restauraunts accross Cork, so dont want to keep them waiting too long! We’re fairly confident that they’ll settle a little in the coming months, but at the moment will be perfect with the likes of Rotisserie Chicken, (check out The Spitjack on Washington Street), the hay smoked Duck, (Sage Midleton), or the Blowtorched Medallions with Chorizon and Tomato Bean Stew, (Cask Cork). And don’t worry if you preferred the last batch; we are currently finishing off a batch of Demi-Sec Bittersweet, (Medium Sweet), which is based on our French Apple varietals like Avrolles, Antoinette, Muscadet de Dieppe and Frequin Rouge along with Dabsand Michelin and some Katy to give a bit of zing.